L ori Dennis is making a child’s room come alive by inclusion of the smallest details. For this room, that means outfitting it with a firefighter’s changing station; hat and coat included. The large tile, painted brick and tree mural give the appearance of an outdoor environment while a cozy mattress tucked away inside of a fire truck model, makes the child know there’s no place like home. For a more natural approach, Dennis uses eco-friendly materials. “After all, we spend a third of our lives in our bedrooms, they should be healthy spaces, that reflect needs and likes,” says Dennis. 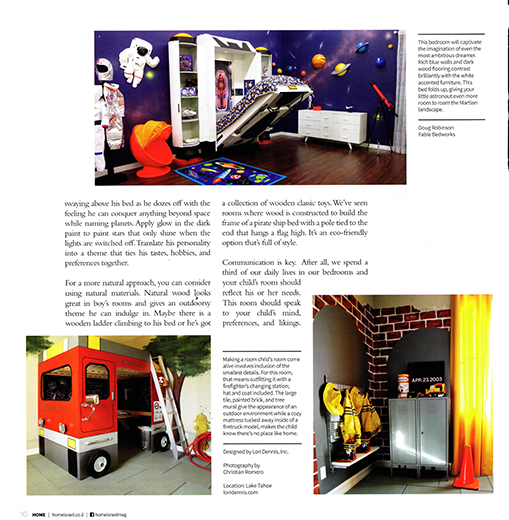 Our children’s room was selected as one of the best in the international community. We are very thankful to be recognized for being one of the best spaces for kids.